Hii guys today we are come here to see how to unlock pattern on an android device without losing any data. We all know that the Android is very powerful as well as very big platform of a smartphone, all most 70% of the market is undertaking by android. This is due to its large collection of useful apps and games. There are lots of different apps are available on google play store. Some of them are free and some of them are paid. I think you must have checked the complete guide of how to download paid android apps for free on android. See complete guide of how to unlock pattern lock without bellow. So most of us take very usefully and sometimes confidential data on our smartphone. So to keep our data secure most of us are using password and pattern lock or sometimes security apps on our android smartphone. I have a question to all of my readers ??? Can you lost your password or pattern of your android phone?? I know most of you facing this situation . In this situation, only thing can do a factory restore the form recovery mode and lose all data on the phone. Can you tell me it is the right solution to this problem of android unlock pattern security? No, I have some the methods by which you can easily unlock your password and pattern on your android smartphone without losing data. Today I am going to give best and 100% working methods to unlock your device without losing data or how to unlock a locked android phone. All the methods are working properly. So know it’s your time to choose which method is best for you. Try android device manager unlock device bellow. How To unlock Pattern Lock or Password on Andriod Phone Without Losing Data. Steps to unlock pattern lock or password on any android smartphone without losing data. Step 1: Copy your Aroma File manager and paste into micoSD card. Then insert microSD card into the locked android device. Step 2: Now you have boot your android smartphone into Recovery Mode By pressing and hold power Button + Volume up Key at the same time for 8 seconds. Different phone have the different option to open recovery mode. If above method is not open your recovery mode. Then you have to google and search the right method to open recovery mode for your Device model. Step 3: Now you have to select Install Zip from SD Card option by using volume up and volume down for scrolling up and down respectively and power button to select the option. And then install Aroma File Manger. After installation Aroma File Manager will Open. Step 4: Now see you the Aroma File Manager on your device screen. Ok, Now you have to go to settings and select Automount all devices on start option, this option is present at bottom and exit. Step 5: Now you have again selected Install Zip from SD Card and then install Aroma File Manager as same as you have done step 3. Aroma File Manager will open again. Step 6: Now goto Data Folder > System Folder and search for gesture.key for pattern lock and password.key for a password. After the finding one of these files deletes it. these files take your password or pattern. Step 7: After the deleting, the file reboots your device normally you will see the password or pattern lock still there. Don’t worry just enter any password or draw any pattern your device will be unlocked. Note : This pattern or password will be used to unlock your device next time. You have to keep this password or pattern in secure place. 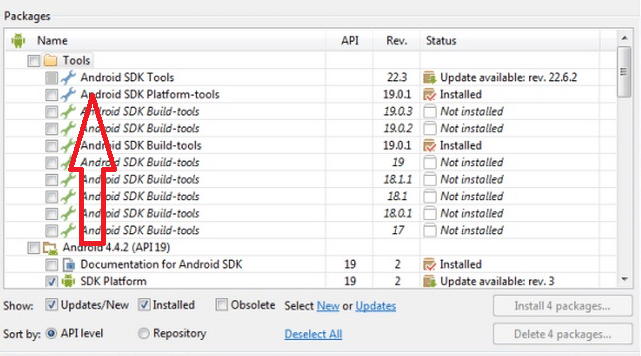 step 1: Download latest Android SDK Tools on your PC to run ADB commands. Step 2: After the downloading SDK. You have to install it on your PC. When installation windows open you have unchecked all the packages and only select the Android SDK Platform-Tools. Install this package. Step 3: Now you have to do two things one install your device driver on your PC, By which your PC detect the device. and a thing is you have to activate USB debugging on your smartphone. Step 4:Connect your Android smartphone to your Computer Via USB. And navigate the folder where you installed Android SDK Tools Users > App Data > Local > Android > Android SDK > Platform Tools. Step 5 : Once you entered the platform tools folder you have to open command windows by hold shift key and right click and select open command windows here. Then command windows will open on your computer screen. Step 6: Now you have to enter the command “adb devices”. Step 7: Now you have entered this given bellow. Step 8: After the enter the above command in command windows then press enter. Step 9: Now you have to reboot your Android phone. You will the password or pattern are removed without losing any data. see this alternative method of android unlock pattern reset. Be careful while using this method. Note: This method will erase all data and settings on your device. So be confident in applying this method. Step 1: Turn off your phone and boot in recovery mode by press and holding power + volume up button on your device. Step 2: After the entering in recovery mode your select factory data rest option and then select Yes option. Step 3: Then Select. Wipe Cache Partition option. Step 4: After completion of above process you have to reboot your device. I want to tell you again that this method will erase your all data and setting so be careful while using this method. I personally recommend you to using method 1. I apply this method to various Android smartphone and this method 100% working. I hope this method will also work for you. If this method does not work then choose method 2. If you can face any problem during the process feel free to ask me by commenting in the comment box. I will solve your problem. I have done my Best in this guide How to Unlock Android Phone Password without Factory Reset. Now it’s your term share and this guide on any social network and with your friends thank you keep visiting.